We're going to take a break from our live coverage for the evening, as celebrations continue on the streets of Zimbabwe's capital. Zimbabwean president Robert Mugabe has resigned after 37 years in power. Want to know more? You can browse through all our articles on the crisis here. Emmerson Mnangagwa - widely expected to be appointed as president in the coming days - will return to the country shortly, officials said. A spokesman for the ruling Zanu-PF party told AFP: "I believe that the fired vice-president Mnangagwa, who the party central committee endorsed... will come back in the next 24 hours or so and he will be the one who will be sworn in to be president for 90 days." Earlier, Reuters had quoted another party official as saying that Mr Mnangagwa would serve the remainder of Mr Mugabe's term until elections are held next year. 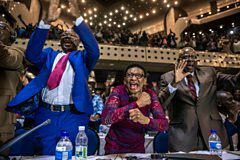 Zimbabwe's activist pastor Evan Mawarire cannot hide his joy over news that President Robert Mugabe resigned. Pastor Mawarire is known for leading the #ThisFlag protest movement, and was detained in 2016 for opposing President Mugabe's rule. He backed a stay-at-home strike in July 2016, which was one of the largest anti-government protests the country had seen in years. 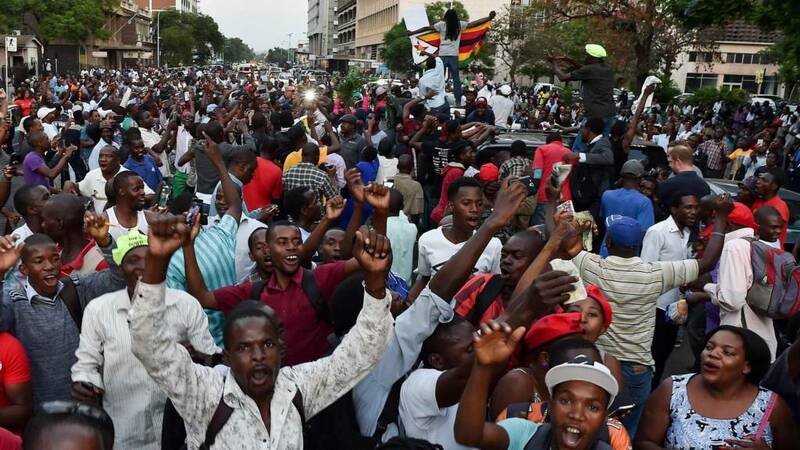 Amid lively celebrations in the streets of the capital, the country's top general - who was instrumental in toppling Mr Mugabe - has called for "restraint". "Against the backdrop of the latest developments in our country, your defence and security services would want to appeal to all Zimbabweans across the political divide to exercise maximum restraint and observe law and order to the fullest," Gen Constantino Chiwenga said in remarks carried by the AFP agency. Opposition leader Morgan Tsvangirai hopes that Zimbabwe is on a "new trajectory" that will include free and fair elections. It has been an open secret in Zimbabwe for many years that Emmerson Mnangagwa wanted to succeed Robert Mugabe as president. It seems he is now doing so. The former vice-president has had a volatile political career - you can read about it here. Honourable members. In the powers vested with me as the presiding officer now, I terminate business and I want to notify you of the following. "...I, Robert Gabriel Mugabe, in terms of Section 96, Sub-Section 1 of the Constitution of Zimbabwe, hereby formally tender my resignation as the president of the Republic of Zimbabwe with immediate effect. My decision to resign is voluntary on my part and arising from my concern for the welfare of the people of Zimbabwe. And my desire is to ensure a smooth, peaceful and non-violent transfer of power that underpins national security, peace and stability. Yours faithfully, Robert Gabriel Mugabe, President of the Republic of Zimbabwe. Can Zimbabwe expect foreign aid in its transition? For years, Zimbabwe has been mired in the depths of an economic crisis - a challenge which has not disappeared. Our World Affairs Editor also suggests that certain foreign powers will be keen to restore Zimbabwe - and that may mean a good deal of financial aid. Most people assumed that the only way Robert Mugabe would give up being president was to die in his bed. He probably thought so too. In fact the last of the old-style 1970s and 80s liberation leaders most untypically resigned in writing. Perhaps that says something about the way the world has changed in the 21st century. No storming the presidential palace, no ugly end at the hands of a crowd like Colonel Gaddafi, no execution by firing squad like President Ceausescu of Romania, no hanging like Saddam Hussein. Zimbabwe, in spite of everything Robert Mugabe visited upon it, is essentially a peaceable, gentle country. And despite all the immense crimes for which he was responsible, he is in some ways an intellectual, rather than a brutal thug. He’ll be remembered for the massacres in Matabeleland in the 1980s, for the farm invasions of the 1990s and later, and for the brutal repression of the opposition Movement for Democratic Change when they seemed on course to win the 2008 presidential election. The man who seems about to take his place, former vice-president Emmerson Mnangagwe, was deeply involved in most of those crimes, yet people in Zimbabwe - like the outside world - will be so relieved to see Mugabe go that they will be tempted to forget all that. They’ll also forget the few unquestionably good things Robert Mugabe did. Zimbabwe, for instance, has an extraordinarily high literacy rate, because of him. But that’s certainly not what he’ll be remembered for. During his first years in office, Mugabe was feted by leaders across the world, including Cuba's Fidel Castro. See more pictures from his life in office, here. Mugabe - hero or villain? From an icon of his nation's liberation to a cartoonish dictator - what was Robert Mugabe's rule like? Quote Message: Even after 37 years in power, Mr Mugabe still maintained the same worldview - the patriotic socialist forces of his Zanu-PF party were still fighting the twin evils of capitalism and colonialism. Even after 37 years in power, Mr Mugabe still maintained the same worldview - the patriotic socialist forces of his Zanu-PF party were still fighting the twin evils of capitalism and colonialism. Read more: Is Zimbabwe's ex-president a hero or villain? Following their report that former vice president Emmerson Mnangagwa will be sworn in as vice president in the coming days, Reuters now says he will serve until 2018. The chief whip of ruling party Zanu-PF, Lovemore Matuke, told the news agency that Mr Mnangagwa would serve the remainder of Mugabe's term. Under the current schedule, the next general elections could be held as late as September 2018. Guinean president and current African Union chief, Alpha Conde, has said he is "truly delighted" that former President Robert Mugabe has agreed to resign. Mr Conde also described Mugabe as a "great fighter" and an "African hero". "It is a shame that he is leaving through the back door and that he is forsaken by the parliament," he added. Mr Conde said that the presidential election should be held in 2018 and that the African Union will offer all its support to Zimbabwe for its organisation. Reuters news agency reports that Mr Emmerson Mnangagwa - the former and briefly exiled vice-president - will be sworn in as president on either Wednesday or Thursday. It quoted the ruling Zanu-PF party's legal secretary. Speaking to BBC television earlier, activist and political candidate Vimbaishe Musvaburi cried as she described what Mr Mugabe's departure meant. Her appearance struck a chord with many on social media. A Zimbabwean academic has shared a video of a man taking down a portrait of President Robert Mugabe. She has not said where the video was recorded. Zimbabwean media mogul Trevor Ncube has described President Robert Mugabe's resignation as a "stepping stone" towards building a successful country. Zimbabwe's sacked Vice-President Emmerson Mnangagwa will take over as president in the next 48 hours, ruling party chief whip Lovemore Matuke has told The Associated Press news agency. Mr Mnangagwa engineered the downfall of Mr Mugabe after he sacked him about two weeks ago. The veteran leader apparently wanted to anoint his wife, Grace Mugabe, as his political heir, but the move backfired as the army and ruling party rallied behind Mr Mnangagwa.